and Raoul Glynn at the news conference on Wednesday, August 8, 2017. The Demerara Tobacco Company Limited (Demtoco) on Wednesday said it is too early to take take legal action to stop the enforcement of legislation that bans smoking in public places and will almost literally wipe out street-corner cigarette vending. “At this stage, it would be extremely premature and, for me, I would consider it wrong to make any pronouncements about a legal action,” Demtoco Director, Raoul Glynn told a news conference. Demtoco instead appealed to President David Granger not to sign into law the Tobacco Control Bill, already approved by the National Assembly, and allow for broad-based consultations on the Bill that would see several hundred cigarette vendors being removed from the streets across Guyana. “We would like to have this engagement and if we have this engagement, threatening to do things, I don’t think is the right way to engage,” added Glynn. The company said 15 percent of the 3,800 retailers countrywide are cigarette vendors who stand to lose their livelihoods. “When look at hawkers around Bourda Market, Stabroek Market; they made a choice to sell a legal product in a legal way and you are saying to them your livelihood is now gone. There are no alternatives,” Glynn said. The Tobacco Control Bill bans the sale of tobacco products by vendors and in health care facilities; sports, athletic or recreational facilities; government buildings; educational facilities or any other place prescribed by the regulations or they would be fined GYD$400,000 and jailed for six months. “No person shall go into any public place carrying any tobacco product, electronic delivery system or component, in a tray, container or otherwise for the purpose of making sales or commercially displaying the product,” states the Bill which also prohibits the sale/purchase of tobacco products by electronic vending machines or via the Internet. Warning that Guyana would likely follow other countries where passage of similar legislation has resulted in a loss of about 70 percent in taxes from tobacco products, Demtoco also expressed worry about how the laws would be enforced practically. Based on experiences that British- American Tobacco (BATCO) in Suriname, Jamaica, and Trinidad and Tobago, Kirton said smoking would not decrease but would shift to smuggled cigarettes. 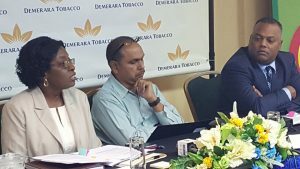 Managing Director of Demtoco, Maurlain Kirton said concerns about the adverse impact of the Tobacco Control legislation have been raised with several government ministers and opposition People’s Progressive Party (PPP) parliamentarians after formally lobbying them for the law to be taken to a bipartisan select committee. Kirton, however, said the elected representatives from both sides of the House gave no firm commitments. “The general consensus is that we have taken note of your comments. In terms of our concerns that were raised, there were no commitment as to what will happen with the Bill,” she told a news conference. Stressing that her company was not opposed to regulation that is balanced and enforceable, she said if the Bill becomes law her company would abide by it and seek to inform all stakeholders and shareholders about its implications. “We have a responsibility to let the stakeholders know that we are stilling selling a legal product so there is nothing illegal that we are doing, there is nothing wrong that we are doing and to understand what the law is now requiring from them,” Kirton said. Asked why smoking is good for your health, the Managing Director said “it was never posited by the tobacco company that tobacco smoking is good for your health.” “We are advocate not of the industry that smoking is good for your health. We are an advocate that we are selling a legal brand and we are selling that brand to adults who have chosen to smoke,” Kirton said. Demtoco last year paid GYD$4 billion in taxes, a large amount of which government said is spent on illnesses due to tobacco smoke. However, a senior official of Guyana’s Ministry of Health told Demerara Waves Online News that there are no available statistics showing specifically how much is being spent on treatment and care of persons suffering from smoke-related illnesses. “We would have to do a back research on all the conditions and establish tobacco as a cause. Lots of the data we have do not have information on tobacco use or exposure,” the official told Demerara Waves Online News. Official statistics also reveal that 87 people were reported to have suffered from lung cancer from 2001 to 2004. In addition to lung cancer, smokers also suffer from kidney disease and poor circulation.